With the ever-changing health care coverage in today’s world, it’s more important than ever that we as citizens learn how to save money on health care costs. Rising prescription drug costs and higher co-pays in the medical world mean more money out of the pockets of most citizens. There are ways, however, that we as citizens can help minimize the amount of dollars that leave our pockets for health care costs. Today I’ll share six ways you can save money on health care costs yet still provide for a healthier you. A medical expense FSA, or “flexible spending account”, allows you to take pre-tax dollars from your paycheck and set it aside to cover medical expenses for the year. This allows you to save money that you use for medical expenses from being taxed, and it makes your net income lower as well. The caveat, though, is that any FSA funds that you put aside that are not used during the calendar year in which they were deducted from your paycheck “disappear” at year’s end. It’s wise to see a doctor when you have concerns about your health, however, many people make trips to the doctor for things that are unnecessary, such as for a mild cold or the occasional bout of constipation. Making unnecessary trips to the doctor costs you money that might not need to be spent. If you’re unsure about whether or not you need a doctor visit, call your doctor’s office nurse triage line and ask to speak to a triage nurse, who can properly assess whether or not a visit to the doctor is needed. A friend of mine recently found out that, as of January 1st, one of the prescription drugs she needs for a family member increased their patient co-pay up to $850 per month, and this is with good insurance! Unable to pay that kind of money, she called her doctor and asked if there was another medicine that will do the same job and cost less. Her doctor did his research and switched the family member to a drug that did the same job, but has a copay of $125 as opposed to $850 each month. When choosing medical tests and necessary prescription drugs, be sure to ask about co-pays and also have your doctor check and see if there are less expensive alternatives, thereby putting more money into your pocket each month and spending less on medical care when a quality alternative is available. Study after study has proven that a healthy, whole foods diet that minimizes consumption of processed foods and high-sugar foods can do a great job at not only maintaining your health, but improving your health as well. Diseases such as Type II Diabetes and Heart Disease can often be controlled with a diet that is high in vegetables and fruits, and low in unhealthy fats and processed grains. Educate yourself on what particular types of foods do to the human body, learn how to make healthy meals to eat, and work to do what you can to improve your health through a clean diet. Exercise, even in small doses, goes a long way in maintaining and increasing good health. Even low-impact exercises such as stretching, Pilates, yoga and swimming are wonderfully beneficial to the human body. Make a commitment to get moving, even if it’s as simple as parking further away from the door, doing simple stretches each day or taking the stairs as opposed to the elevator. All of these health improvement techniques add up to a healthier you, and create a potential breeding ground for lower medical care costs. Don’t give in to the belief either that you need to have a high priced gym membership to work out either as there are many ways you can get fit at home that cost little to nothing. While this may seem like an anti-money-saving tip, the truth is that settling for subpar care and medicines might actually lead to worse health and increased health care costs. While subpar care might save you money initially, it has the potential to cost much more money in the long run. Your health is precious. Never settle for anything less than great medical care by your medical care provider. Even with rising health care costs, we do have some control over how much we spend on health care. Choose to educate yourself on what it means to improve your health and cut costs where you can on health care without compromising your health. Your body will be healthier, and your savings account, will be healthier too. 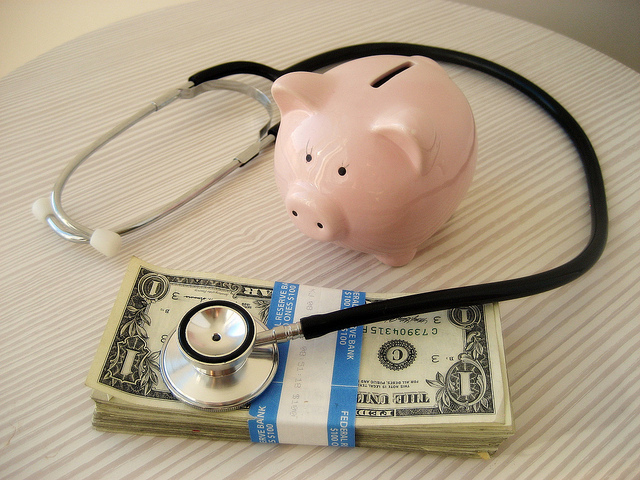 What do you do in order to save money on health care costs? Do you have access to and save money in a FSA or HSA? How do you balance saving money without giving up on quality care? Definitely eat well and exercise! Simple things that we may ignore but definitely one that can save us from a few cough and colds in a year. I found this to be very much true in our lives as well. Since we’ve started eating primarily whole foods, we are rarely sick. Awesome! My mother actually lost health insurance for a period of time and found that doctor’s offices were very flexible when she said that she was a cash payer. So I think sometimes you need to check with your doctor to see if maybe you would be better off paying in cash than health insurance. It seems counterintuitive; however, with the rising healthcare costs for everyone, it doesn’t hurt to check every avenue. Love that, Shannon! Thanks for bringing up a great point. We’re so conditioned to use insurance that we don’t think about paying cash. Great tips Laurie! I really think exercise and eating right are the best tips for lowering healthcare costs the people overlook. I think so too, Kayla. Those two things have made a huge difference in our lives, along with making fresh, clean water our primary drink. Your pharmacist is another great resource to ask about drug prices and copayments. Pharmacists understand the insurance company copay tiers and know which drugs are in the same family. They can certainly give you the options available so that you can discuss with the doctor. Excellent idea, Alan!! Thank you for sharing that valuable, money-saving tip! I like your exercise and eat healthy suggestions 🙂 Preventative care is invaluable. Too bad it doesn’t solve every problem, but it does combat a lot of them! It sure does, Anne. Preventative care is much more valuable than corrective care. In my household, medications make up the bulk of our medical expenses. We save by using generics when possible, and using manufacturers’ co-pay assistance programs for expensive brand name medications (check the manufacturer’s website). It also helps to check your insurer’s formulary (the list of approved medications) as those will almost always be less expensive than drugs not on the formulary. Preventative care is critical to saving money in the long-term. It’s a lesson I wish I learned sooner, but it’s never too late to start living healthier. Gary, you guys are doing all the right things, including living healthier now. Keep up the great work, and thanks for sharing some valuable tips! I make it a point to eat well and also exercise on a regular basis. I usually only go to the doctor once a year for my regular check-up which is mostly covered by my insurance. This has also helped me to really only see others – dentists, dermatologists, eye doctor – for my regular check-ups.